In her author’s note, Marion Winik writes that in Mexico on the Day of the Dead, "people build altars to their loved ones . . . they go to the cemetery and stay all night, praying, singing, drinking, wailing. They tell the sad stories and the noble ones; they eat cookies shaped like skeletons. They celebrate and mourn at once." 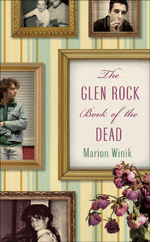 Striking that balance, The Glen Rock Book of the Dead presents snapshot portraits of The Jeweler, The Driving Instructor, The Bad Influence, The Queen of New Jersey—and roughly fifty others who have touched Winik's life, from her son’s second grade teacher to Keith Haring. Tied together by the inimitable, poignant voice of Winik, these losses form not only an autobiography but a story of our time, delivering a lyrical journey that ultimately raises the spirits.